Growth vs. Sustainability: Can Tokyo Have It All? Hiroyuki Isobe, CRE, FRICS, is a certified real estate appraiser in Japan and the chairman and founder of Japan Valuers Co., Ltd. in Tokyo. Since establishing his appraisal firm in 1983, he has performed various counseling assignments in regard to city planning, feasibility studies, and market researches in Japan and the U.S. He has been heavily involved in valuation and analysis after the real estate securitization scheme came into effect in early 2000s, He has recently engaged in the valuation and advisory projects in Myanmar, Malaysia, New Zealand, Guam, California, and Hawaii and recently established a company in Myanmar for real estate counseling He was honored to be the first Japanese CRE in 1988. A strong economy or a stable lifestyle: Which scenario is preferable? that tomorrow would be better than today as long as we worked hard. Dr. Ezra Feivel Vogel published a book titled Japan As Number One in 1979 in which he analyzed the secret of the rapid economic growth that made Japan second in the world in terms of GDP. However, Japan’s GDP has fallen since 1996, whereas the United States’ has grown twofold and China’s has increased twenty times during the same period. 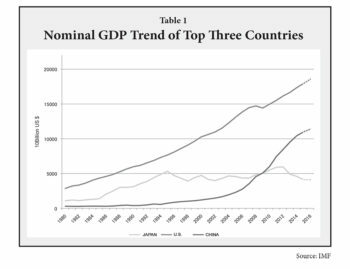 Although Japan is currently ranked third next to China in GDP, Japan’s nominal GDP actually remains at 23 percent of that of the U.S. and 38 percent of that of China. Does it mean that Japan’s economic presence within the globe has substantially decreased? Will it be weakened further? Does Japan still need to enjoy further growth? Isn’t Japan already in a position to be able to enjoy a fairly matured level of growth among developed countries? 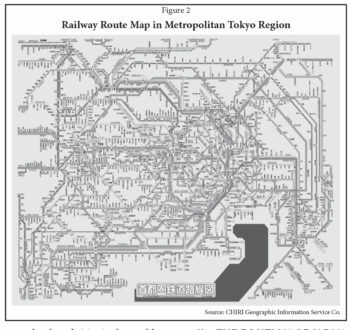 Tokyo is one of the most developed cities in the world in terms of public railway networks. Using public transportation is definitely faster, less expensive and safer than driving. Tokyo is highly transit-oriented and transit friendly. There are approximately 3,000 km of railway networks within a 13,600km2 area including the prefecture of Tokyo, Kanagawa, Chiba and Saitama (Metropolitan Tokyo Region, or TMR hereinafter), which is only 3.6 percent of Japan’s total area of 378,000 km2 (see Figure 2). Tokyo is also a place of Western influence. Starbucks Coffee for example, with some 20,000 shops globally, has over 1,000 shops in Japan; As of 2013, it is the third in the world next to the U.S. and Canada. In addition, nearly 44 percent of shops in Japan are located in TMR. As such, there are 2,497 French restaurants in TMR — which is 33 percent of all French restaurants in Japan. Tokyo is both an efficient place to live, as well as a place where western culture mixes with traditional Japanese culture. Japan has been described as a small country. Because of its small size, economic success after the war is notable. Japan is definitely smaller than China or the U.S.; it’s even smaller than the state of California. However, it is similar to the major European countries in size. It’s more densely populated compared to China and the U.S., but the population density in the major European countries does not show substantial difference from that of Japan. Japan’s GDP is ranked third, but the gap between the U.S. and China will most likely widen considering the fact that the growth rate in Japan seems lower than both of these two countries. GDP per capita in Japan, on the other hand, seems to remain in a fairly good position among developed countries, although it is far below the U.S.
CO2 emissions are one measurement of international economic positioning (see Table 3). As far as the carbon dioxide emission is concerned, the total amount seems relatively low considering the level of GDP. However, its per capita amount is not as low as the ones in European countries although it is lower than that of the U.S. It could be said that Japan is doing fine, but that its performance is not as outstanding as in the past. 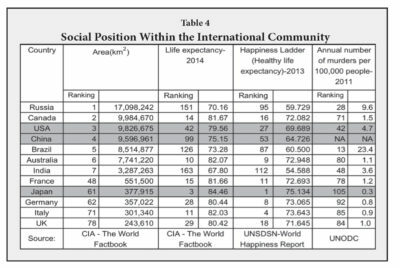 Nevertheless, the statistics below indicate that Japan is third in terms of life expectancy, next to Monaco (89.57) and Macau (84.48). It is the No. 1 country in the world where individuals live the longest and in good health without the need for nursing care. It is also one of the safest countries in terms of the murder rate. Although we may not be able to expect substantial population growth, Japanese society has achieved a matured level so that it can afford residents a reasonably high quality of life. After the industrial revolution of the late 18th century, the world population started to experience a drastic increase. It reached 7 billion in 2015 and forecasted to reach 10 billion in the late 2050s (see Figure 6). Most of this explosive growth will occur in developing countries. 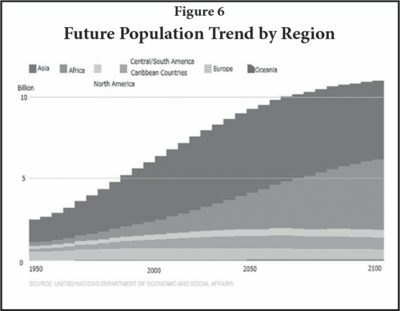 Developed countries are forecasted to either stabilize or have a decrease in population. Japan’s 2015 Census revealed the first decrease in population since its start in 1920. In addition, the ratio of aging population (over 65) is estimated to grow faster than many other countries despite the fact that, as of today, it is already over 25 percent. The working-age (15-64) population started to decrease in mid-1990s. As a result, it is highly likely that Japan will face not only an economic decline but also an increasing financial burden on pension benefits and various social costs to care for senior citizens. 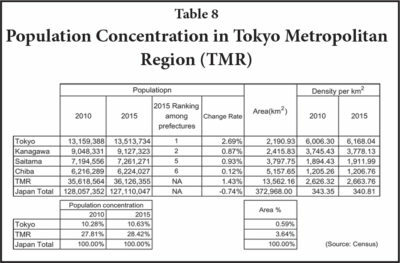 In contrast to the previously presented information, the population in Tokyo prefecture as well as TMR has continuously seen an increase. Over 10 percent of the population lives in Tokyo prefecture, where the area is less than 0.6 percent of the entire country. Approximately 30 percent of the population is concentrated in TMR. The population density in Tokyo prefecture is eighteen times as high as the national average. Annual income per capita in Tokyo is shown far above the national average and Japan’s major business activities are dominated in Tokyo. Although the absolute number is quite small, Tokyo is the most cosmopolitan city in Japan, and perhaps the world. One measurement of this is the high number of movie theaters in Tokyo indicates that it has a substantial entertainment base. Based on these concentrations, people living in Tokyo are entitled to enjoy Tokyo’s advantage in every aspect. The number of wealthy households (Annual income is over JPY 10 million) per 100 is 8.75 in Tokyo — No. 1 in Japan — and far above the national average of 5.53. Wealth is also definitely concentrated in Tokyo. It should be noted; however, that the relative poverty ratio in Tokyo (the ratio of households with less than half of the average income in a particular area) suggests that 19.85 percent of households in Tokyo are in this category and Tokyo is ranked 15th among 47 prefectures. The population concentration in Tokyo has also caused a serious gap with rural areas in various aspects such as demographics, regional economy, politics, etc. 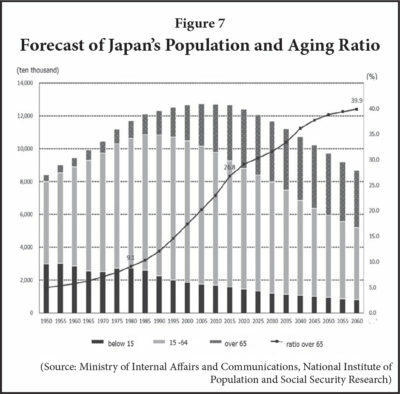 Of critical importance is that no region or prefecture will be able to avoid the declining population and overall aging trend. Tokyo is not an exception. 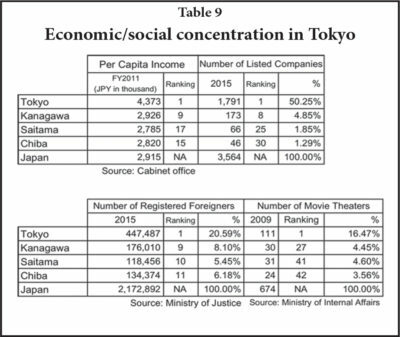 Tokyo’s phenomena might be more serious than other areas because the level of concentration in population is astonishingly extreme in Tokyo. 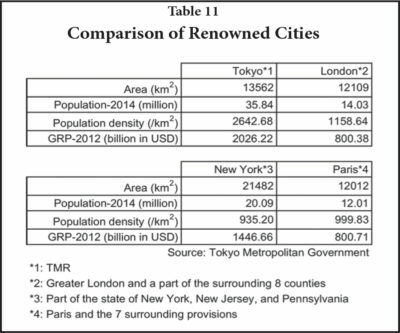 Whereas Japan’s population in 2060 is estimated to decrease to 86,740,000 — 32 percent lower than that of 2010 — Tokyo’s population will decrease by 18 percent during the same period, which seems to suggest that the rate of decline is more moderate in Tokyo. However, the population of senior citizens (over 65) in Tokyo would increase to four million in 2060, which is larger than today’s population of the city of Los Angeles. As introduced previously, Tokyo is exceptionally transit-oriented and transit-friendly. The entire region is covered by railway networks and the city is highly mobile with a very low reliance on the automobile to conduct daily living functions. 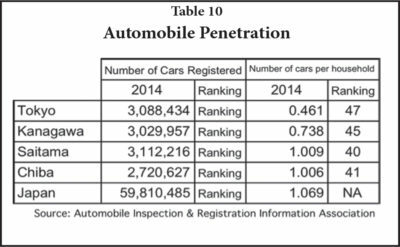 The car owning ratio in Tokyo is the lowest among 47 prefectures in Japan, as shown in Table 10. According to the 2014 version of the World Urbanization Prospects by the United Nations, there are 28 metropolitan areas with populations over 10 million, of which seven areas are populated with over 20 million. TMR is the only area with over 30 million, followed by Delhi, Shanghai, Mexico City and São Paulo, all of whose total population is less than 30 million. Tokyo is undoubtedly the largest mega area in the world. It is not surprising, therefore, that the amount of GRP (Gross Regional Product) of TMR is positioned within the tenth if compared in the country GDP ranking. Financial Times, which conducts city analyzes every two years, selected Tokyo just behind Singapore in city ranking among 163 cities in the Asia-Pacific region. Tokyo won in terms of level of infrastructure and strategy for foreign direct investment. If a measure to address English communication were approved, it could be ranked as the top. 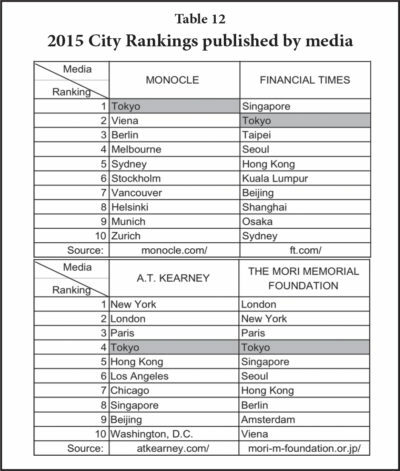 The Global Cities Index announced by A.T. Kearney ranked Tokyo 4th in the world in terms of city ranking. It was highly evaluated in the human capital criteria among others, such as the highest percentage of university graduates. On the other hand, Tokyo was ranked 18th in future potential due to the negative impact caused by the decline of population. The Mori Memorial Foundation periodically evaluates 40 world cities by six functions to determine their comprehensive power. In 2015, Tokyo was ranked 4th . Because of the 2020 Tokyo Olympics/Paralympics, Tokyo’s economy is ranked 1st and ranked 5th in terms of cultural interaction. This low ranking was due in part to the poor accessibility from Haneda Airport as well as a limited number of available flights both to and from the airport. 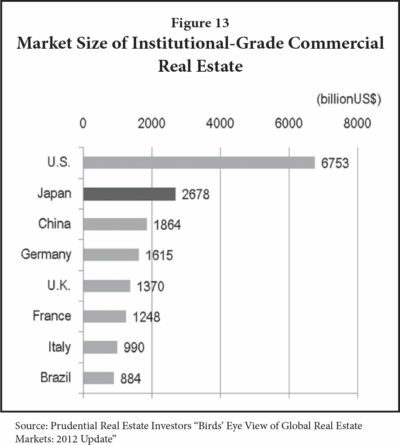 The Japanese real estate market is huge — the second largest in the world as shown in Figure 13. 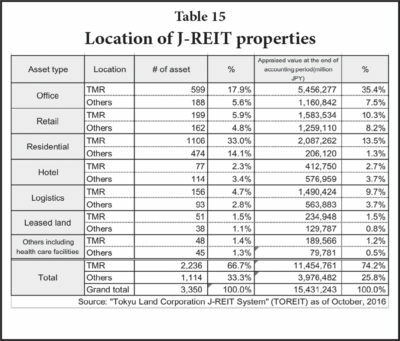 Japan’s Real Estate Investment Trust (J-REIT) started in 2001 and its market has steadily expanded. 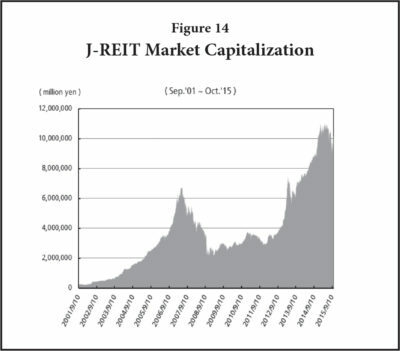 The current number of the public J-REIT is 56 and the total market capitalization is estimated approximately 15 trillion JPY, which is ranked second next to the U.S. in terms of the number as well as the market capitalization. Because the rate of Government Bonds has been at an extremely low-level, even negative, the Yield Gap has been approximately 5 percent. That is large enough to attract institutional investors from overseas as well. As a result, the Japanese property market has played an important role within the cross border investment market, even though the actual property yield is not as high as in a developing economy. What is important is that the institutionally qualified investment properties are, again, concentrated in the TMR. Tokyo is a large collection of population, economy, culture, politics, etc., and there are numerous investment grade properties in every property type, compared with other areas in Japan. Japan experienced a surprising growth after WWII and has played an important economic role within the global economy as a member of both G6 and G7 countries. However, the economic strength of the G7 has weakened since the 1990s due to the rise of emerging countries such as Brazil, Russia, India, China and South Africa. Economic growth in G7 countries will be substantially lower than that of developing countries, as G7 countries are about to encounter various social/cultural issues. Japan is one leader that will face these problems first and foremost among G7 countries. This is due to the low GDP growth; the fastest aging population and substantial decrease in the working age population; and the worst outstanding balance of government debt in the world with 250 percent of GDP. In addition, the increasing expenditure for Social Security and medical care are significant factors to be faced. Rapidly increasing urbanization is a critical issue in many developing countries as well. The ratio of urban population is already over 50 percent as of today and is forecasted to be 66 percent in 2050. To achieve better living, a better environment and a more satisfying quality of life with lower economic growth will be a challenge for every nation, whether developed or developing countries. What has to be recognized is that we will have to abandon the lifestyle of wasteful mass consumption, and we must eliminate inefficient use of resources. More importantly, we have to accept the fact that we can no longer enjoy affluent lives using unlimited amounts of these resources. In September 2015, the United Nations adopted the 2030 Agenda for Sustainable Development at the Millennium Summit.5 The international community declared that it would achieve sustainable growth with 17 Sustainable Development Goals (SDG) and 169 targets. We have no excuse not to reach these goals, which would not be possible using 19th century technologies. Today, we are in the beginning of new era of the Fourth Industrial Revolution (4IR). Our way of lives will definitely be transformed with revolutionary technology, such as Robotics, AI, Nano tech, Biotech, IoT and Autonomous Vehicles. Tokyo, the largest intensely urbanized metropolis in the world, may have to be the leader to indicate the way to solve these issues. The key to it may be how we could visualize people’s reasonable lifestyles and how we could utilize future technology appropriately.